Figure 1: Contamminated and damaged gold edge contacts. From time to time, gold edge contacts become contaminated with solder. This most often occurs during reflow of an assembly and may be caused by solder spatter or solder paste contamination of the contacts due to improper handling, or other reasons. Solder contamination is certainly an unacceptable condition because oxidation will ultimately build up on the solder, inhibiting a proper electrical connection to the mating connector. The solder contamination also transforms the normally smooth connector surface into an uneven surface, further compromising the integrity of the connection. The only reliable way to alleviate the problem is to remove all of the solder contamination and restore the gold plating. What makes the problem troublesome is that the contaminating solder was molten at the time it contacted the gold, and therefore has wetted to the gold plating, making it impossible to remove while leaving the gold intact. It will be necessary to strip the solder completely by both mechanical and chemical means, and to re-plate the contacts. Although this procedure has many steps, it certainly makes more sense than scrapping a perfectly good assembly due to edge contact contamination. Figure 2: Contacts replated (left side), replaced (right side). This procedure is different from many others in rework and repair in that it involves the use of stripping and plating chemicals. Therefore, prudent care must be taken and proper handling procedures followed to protect the health and safety of workers. In a sense, the handling and disposing of the hazardous chemical solutions constitute a - hidden cost - associated with this procedure. Solder stripping, electro-cleaning, nickel, and gold plating solutions contain hazardous wastes that must be handled safely and disposed of properly. For example, gold plating solution contains potassium gold cyanide, nickel plating solution contains nickel sulfate, and electro-cleaning solution contains sodium hydroxide. It is important for every facility to observe the regulations for storing and handling and disposing of these materials, as well as providing adequate running water, ventilation/fume extraction, etc., which can involve some investment if done in-house. Let's begin with the removal of the solder contamination itself. The circuit board assembly must first be prepared by cleaning, then applying plating tape to the area surrounding the problem, to protect adjacent areas and components from the plating and stripping solutions. The next step is to remove the solder contamination. Flow solder over the entire area of any contacts that have been contaminated, so that the stripping solution will act upon the area uniformly. Then, remove as much solder as possible from the contact(s) with a soldering iron and copper solder wicking braid. Clean the area. Figure 3: Gold edge contact replating process. Now, the remainder of the solder can be removed with stripping solution. It's a good idea to position the circuit board such that the area to be stripped overhangs a tray to catch any spillage of the solution. Once the solder has been stripped away, exposing the base metal, rinse the entire area thoroughly with water. Lightly buff the contacts using an abrasive pad, making sure that all contamination or defective plating is removed. Burnish small scratches. Now you're ready to re-plate the contacts. This electroplating process uses a DC power supply. One lead is connected to the connector edge contacts that need plating. A second lead is connected to the plating probe. The plating probe has an anode fastened to the tip that is wrapped in absorbent material. The anode is dipped into high-speed proprietary plating solutions. When the saturated anode is swabbed across the circuit board connector edge contacts, the metal contained in the solution is plated wherever electrical contact is made. A conductive bus must be made to all the contacts that need plating. A reliable bus connection is the most important step in successful plating! There are four (4) basic connection options: soldering a wire directly to the inboard tip or connecting circuit of each edge contact to be plated; applying a thin coating of conductive paint directly to the inboard tip of each contact to be plated; using a mechanical probe to connect to individual contacts sequentially; and making a mechanical connection to each contact using a spring-loaded pin fixture. Each method has its pros and cons and will be more or less appropriate for the application depending upon the individual assembly. Remember that once the bus is connected and you are ready to begin plating, make sure that your technicians wear protective eye-wear, gloves, and clothing! Follow the step by step procedure for plating carefully. This includes making the cathode and cable connections and setting the correct output current on the power supply and voltage/time settings according to the equipment manufacturer's specifications. To plate, dip the plating probe into the electroclean solution. Wait a few seconds for the solution to saturate the absorbent wrapping. 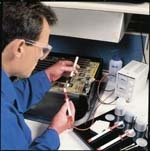 Then, swab the entire surface to be plated by brushing the surface with the saturated plating probe. The plating probe should be moved back and forth briskly to prevent burning and to provide even coverage. Swab the area for the time recommended by the equipment manufacturer. Then, thoroughly rinse the entire area with water. Any burning or darkening of the contacts may be removed with an abrasive pad. Saturate the abrasive pad and the circuit board surface with water and lightly buff the contacts until all evidence of the burning or discoloring is removed. Rinse the entire area with water. Remember not to allow the rework area to dry out between steps. The water coating prevents oxidation. Next connect the nickel plating probe to the power supply, make the appropriate power settings, and apply the nickel plating solution in the same procedural manner. Once completed, rinse and do the same for the gold plating probe and solution. Rinse the area with water. Remove and discard all plating tape and thoroughly rinse the area with water again. Dry the area using wipes. Remove the wire, or conductive paint used to bus the contacts, protecting the contacts from further contamination by masking them with high-temperature tape while removing the bus connection. Finally thoroughly rinse the entire area with deionized water or rinse the circuit board in an aqueous water cleaning system. For precise thickness requirements, the final thickness of the plating should be verified with proper measuring equipment. The plating bond may also be checked by doing a peel test using peel testing tape. Lastly, visually examine the rework area for color and luster.